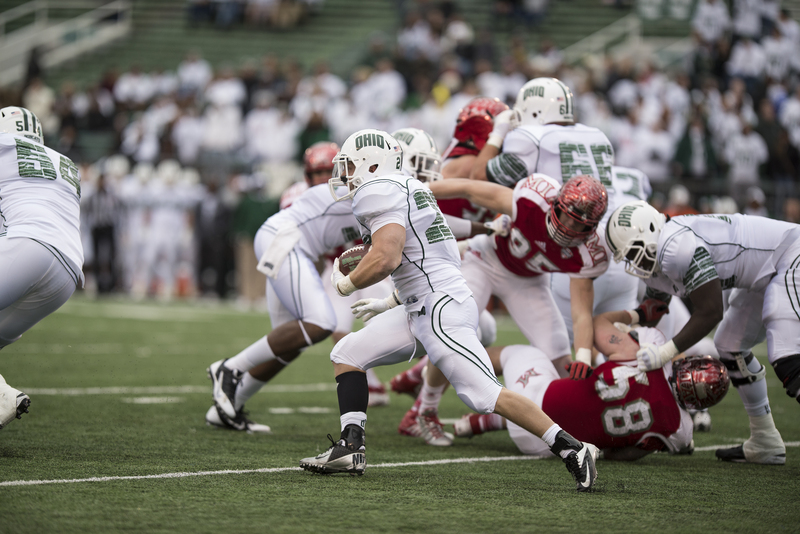 The Ohio Bobcats (6-2, 3-1) have entered the part of the schedule that derailed them in their 2012 campaign. This season, things have played out somewhat differently for the ‘Cats. The injuries haven’t been as nagging, and a nine-day rest before Ohio’s matchup with the MAC East leading Buffalo Bulls (6-2, 4-0) couldn’t have come at a better time. The ESPN2 game is set for an 8 p.m. kickoff on Tuesday, and it will be one of the most crucial games of the 2013 season. With a fan base riding the tails of the Bulls this year, Ohio will be entering an atmosphere at UB Stadium much unlike what they have witnessed against earlier MAC opponents Akron and Eastern Michigan. The buzz has been created by an offense that has already matched its season total for touchdowns at 32 and the stellar play of linebacker Khalil Mack, who is a human black hole. But Ohio can’t let Mack dictate its play-calling. “We have to run our offense and do the things that we do well and know where [Mack] is so we know the open spaces on the field are,” wide receivers coach Dwayne Dixon said. Because of the success that Ohio’s running game had last week thanks to a star performance by running back Beau Blankenship, the play action will be out in full force for the ‘Cats this upcoming Tuesday. That could really open up the passing game for quarterback Tyler Tettleton and wide receivers Chase Cochran and Donte Foster, who have already matched their season totals in receiving yards from the previous season. “They can’t key in on who’s the deep guy [or] who’s the middle guy,” Dixon said of Cochran and Foster. The Bulls’ success on offense can been credited to new starting quarterback Joe Licata and consistent running back Branden Oliver. Licata has been effective for the Bulls offense this season, only throwing four inceptions so far this season. Looking back to the offseason, this may have seemed like a horrible matchup for the ‘Cats, but the emergence of newcomers on the Ohio D has powered the Bobcats to second in the nation with 28 sacks. “They all motivated me to get my head on right and snap in and put out and buy in to what the program is about,” defensive lineman Tarell Basham said of the veteran defensive linemen. Don’t only key in on Mack, especially on third down – If the Bobcats put all of their concentration on offense concerned with where Mack is at all times, this will leave other members of the Buffalo defense unaccounted for. There’s a reason that Buffalo’s unit ranks first in rushing defense (141.2 yards per game), interceptions (13) and opponent’s third-down conversion rate (35.7 percent). This unit is solid all around, but they could be missing two key players, linebacker Adam Redden and defensive lineman Colby Way, because of injury. Offensively: QB Tyler Tettleton – If there’s a weakness to be exposed on the Buffalo defense, it is in its pass defense. Buffalo ranks eighth in the MAC , surrendering 228.9 yards in the air. That number may go up because of the streak that Tettleton is currently on. With three consecutive 300+ passing yards in each of the past three games, Tettleton has hit a stride with his receivers. With Cochran ranking sixth out of FBS players in average yards per reception (22.3 YPR) and Foster compiling 28 receptions for 383 yards and four touchdowns over the span of Tettelton’s streak, Ohio has plenty of weapons that can expose Buffalo’s D through the air. Defensively: DL Tarell Basham – The freshman has come in and has made a league-wide impact already, compiling seven sacks through eight games, which is good for second in the MAC. He happens to be the only freshman making noise on the line in the conference, and he’s also filling in what used to be a huge gap in the offseason. A healthy Ty Branz would help Basham’s development even more, but he’s supposed to miss the rest of the season with a knee injury. Offensively: RB Branden Oliver – The senior running back caught fire just as the Bulls did on their way to six straight victories. Over the past four games, Oliver has been at his best in blowout wins over Eastern Michigan, Western Michigan, Massachusetts and Kent State. He’s averaged 169.8 yards on the ground in those four victories, with seven touchdowns to add on top of his tremendous streak. Ohio’s defense got back on track last week by holding Miami to under 100 yards on the ground, and the extra rest should give the ‘Cats plenty of time to game plan for a back they’ve faced numerous times. Defensively: LB Khalil Mack – This one is a no-brainer. He’s already been a terror this year on defense, compiling seven sacks, three interceptions and two touchdowns through eight games. He’s NFL-bound, but while everyone is talking about his backfield skills, I’m more concerned about how he’s been dropping back this season. Tettleton has made some pretty errant throws this season, and we’re not used to seeing that in the past. He’ll have to watch out over the middle of the field, because he’s been passing there a lot this year. Bobcats 27, Bulls 24 – I know the Bobcats haven’t been tested on the road this year, but with offensive lineman Jon Lechner back in the lineup as of last week, the Ohio offense can break this Buffalo defense. 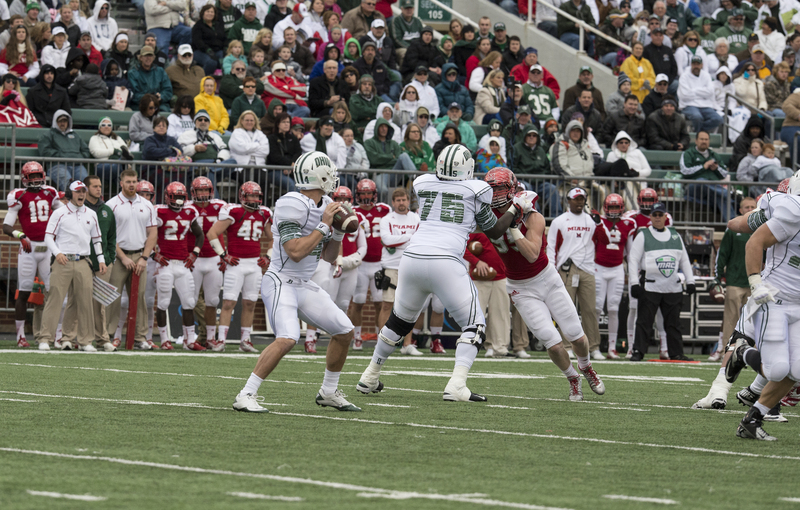 This is Ohio’s time to regain control of the MAC with another game-ending defensive play.